I have been working in the field of Information Technology for 17 years. I remember that a decade ago, when I showed my business partners simple tricks, shortcuts, and cool functionalities in systems or devices – I was able to impress them. Those interactions were engagement starters for me that somehow lead to long-term relationships and multiple joint business-IT ventures. This approach will rarely work in today’s world, where our business partners, like us, are tech savvy users. On many occasions, business users are the ones approaching me about apps they are probing, about cloud-based solutions on trial they are analyzing or new devices and tools they have seen in conferences they just attended. Technology is developing at a much faster pace. This exponential development makes technology easier to use and more accessible. We have gone from an era where only a few people have access to information and technology, to one where it is virtually in everything we do. In business, this results in IT capabilities becoming more embedded into business capabilities. Organizations seeking competitive advantage need to learn how to harness that potential. Business leaders who want to compete in today’s market, and well into the future, have to lead their companies toward a true business and technology convergence. IT-business alignment is no longer adequate where business formulates strategies and IT aligns later. In today’s world, this is a reactive process. Business and IT need to work together to bring engagement upstream and convert solution based conversation into value and business based conversation. Business technology convergence is a journey that will take time and after a repetitive positive cycle of engagement between IT and business. 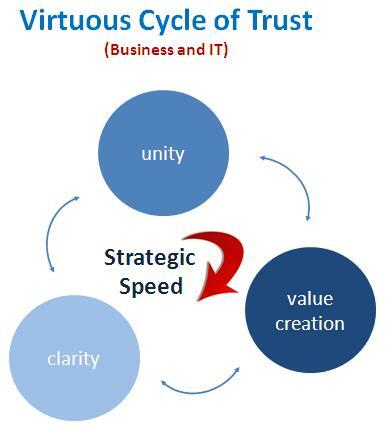 The strategic speed of this convergence depends on three drivers: clarity, unity, and value creation. These are the components of the virtuous cycle of trust. Strategic success is going be tough to achieve if leaders and work teams won’t cooperate for the greater good. You’re dreaming if you expect this cooperation to happen all by itself; patterns of conflict amongst people and organizations occur naturally but aren’t eliminated naturally. There must be a concerted effort to achieve unity. Unity means that once business and IT are clear on where they are headed, they agree wholeheartedly on the merits of that direction and the need to work together to move ahead. The emphasis should be on openness, alignment, and collaboration. If these are the main drivers of unity, leaders need to foster a culture where internal competition, mistrust and turf wars are discouraged. Organizations can achieve unity of effort through (1) shared common objectives and vision, (2) a coordination effort to ensure coherency and common measures of progress and (3) ability to change course if necessary. For example, one belief that I try to dispel many times at work is that a comprehensive platform of services is a prerequisite for creating value. I don’t believe it is necessary to “go big” in order to achieve anything of value all the time. Sometimes, depending on the business initiative, it can be smarter to start small and act fast. On the other hand, you also have to look at sustainable value over time and have to balance both. Especially in large investments, value over a long period of time has to be expected. In summary, I believe Business Relationship Management is the key lever of strategic speed for Information Technology organizations and the business. Business Relationship Managers are “the oil to the machine” that reduces organizational friction. Fast is not always about pace. It is about people and shared perspectives. When all areas or teams are working harmoniously, because rules and directions are clear, it is amazing how much potential value it can create. In faster and successful IT groups, the emphasis is on strategic partnership, flexibility, openness, innovation and continuous improvement as well as taking the time to reflect and learn. These are functions BRMs are expected to do in both the business and IT sides. Does your IT Value Proposition Resonate? Satisfying internal customers means every employee must be constantly aware that customer service is everyone’s business in IT. That constant awareness generates genuine teamwork among all departments in the IT organization: Operations, Projects Department, Support Groups, IT Infrastructure, Business Applications, Process Management, etc. This challenge emphasizes the importance of internal customer service as an IT organizational accountability. Excellent customer service doesn’t just happen because IT teams and individuals want it to, it has to mandated by IT leaders into a service model that includes specific responsibilities to perform and a standard service level to achieve. Revisiting your IT value proposition periodically is an important exercise for IT managers. This will help you understand the tangible and intangible elements that define and differentiate your services portfolio. For internal customers, the IT Value Proposition is the collection of services they receive upon investing in IT capabilities and services. We have to understand that it includes more than just the core IT services (like equipments, applications, and infrastructure), and even more than just good quality— it also involves the softer elements that differentiate the total service offering such as: responsiveness, innovation, collaboration and commitment. Value (Internal Customer’s Perspective) = The benefits received by the business upon investment on IT capabilities and services. Proposition (IT’s Perspective as Service Provider) = The total offering to the business in exchange for their investment. Defining your IT value proposition is the first step to clearly identify how your IT services portfolio are different and better than your competitors. If you run an IT organization that is purely composed of internal employees and do not think you don’t have competitors, you are wrong. There are many 3rd party IT services providers out there who can offer the same type of service that you have. Some, I could tell you, may even offer the same level of service at a better cost than you. Outsourcing companies that provide IT services have increased and matured over the years. Advancements in technology and development of new operating paradigms have made them more accessible and acceptable. They are your competitors and they are out to get your job. If you can’t define some unique feature or benefit that makes you stand out, your internal customers may default to the other option – lower cost. And believe me, you don’t want to be forced to play the low cost game — even when you win, you lose. Follow Glenn Remoreras on Twitter. Sign up email address to follow this blog! 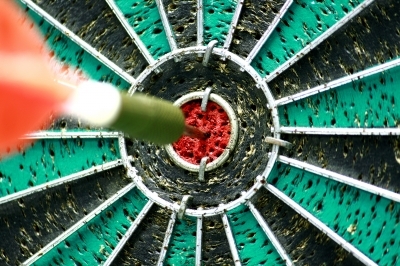 Work-life Lesson 3: Set your performance standards high and never give in to “good enough”. Be your own toughest critic. Digital is "a Way of Doing Business"
This is a personal weblog. This does not represent the thoughts, intentions, plans or strategies of my employer. It is solely my personal opinion.